Brian O'Donnell Quality Home Improvements is the local leading service provider for roofing contractor and skylight services. Experienced with our region’s roofing and skylight needs, Brian knows that a meticulous, quality installation will hold up to decades of New England abuse from sun, wind, rain, snow, ice and hail. Brian’s level of expertise and workmanship will allow you to rest easy while your roof is defending your home from the natural elements. Brian’s primary concern is providing the best solutions to your specific needs. There is no high-pressured sales pitch. After a comprehensive inspection he will give you an honest assessment and a range of options to best suit your needs and unique situation. The bottom line is that we treat you the way that we would want to be treated. Part of what makes our craftsmanship stand out so much is the high quality you can expect. We simply treat your roof replacement or new roof installation the way we would treat our own, if not better. Brian will meet with you and provide you with the information that you need, as well as a quote. He takes a hands on approach to assessing the current condition of your roof and determining if there are any problems. This enables him to provide you with an accurate upfront quote. You can also feel good knowing that we use only a factory trained and certified roofers and not a subcontracted team lacking the necessary credentials. We don't just do skylights, Brian happens to be one of the only Velux 5-Star Certified Skylight Specialists in the area. Each year, we carry out hundreds of installation, repairs, replacement and removal jobs for skylights in residential applications. It is safe to say that Brian takes great pride in the quality workmanship our team invests into each job we take on. Brian also makes it a point to stay current with the latest in technologies for this field, by continuing education. In most circumstances, you can have your skylight installed in just a day and a half! Let us show you what a difference true quality makes for workmanship and customer service. It helps getting roof repairs from someone who understands the situation. Having lived in Connecticut his whole life, Brian is familiar with the weather conditions, as well as the damage that storms can cause. Brian will even work with your insurance company to problem solve for issues like shingle slide, blow offs, damage from fallen tree limbs and any other problem the New England elements can throw at homeowners. Expertly dealing with leak diagnosis and repair service work means getting to the root of the problem. We will use thermal imaging cameras in order to promptly and professionally diagnose elusive leak entry points. This enables us to also provide the highest quality of lasting repair work so you don't have to continue to suffer damage resulting from leaks. The bottom line is that our team is dedicated to providing each client with the finest in quality craftsmanship and customer service, but we also think of the other important details too. Such as, you may take notice that Brian does not use a dumpster for his construction waste. This would be because Eco consciousness is an essential part of his business practice. Any construction waste we end up with is dividied into its base components to be recycled. Then, it is taken to a local recycler to be converted into asphalt and re-usable metal. We care about our clients, our community and the environment as a whole. 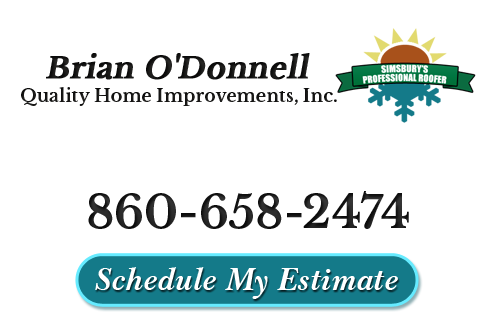 So make the call that makes sense and contact Brian O'Donnell Quality Home Improvements for your skylight and roofing contractor service needs. If you are looking for a roofing contractor in the Farmington Valley area, then please call 860-658-2474 or complete our online request form.